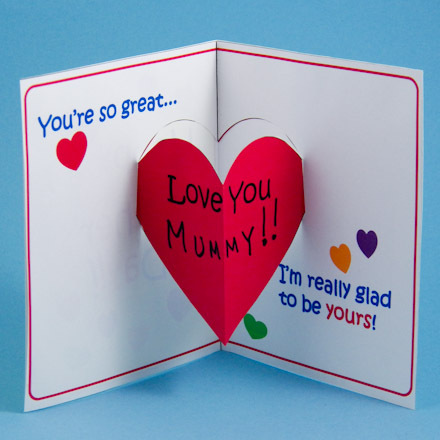 Learn how to make a special Mother's Day card with a pop-up inside. 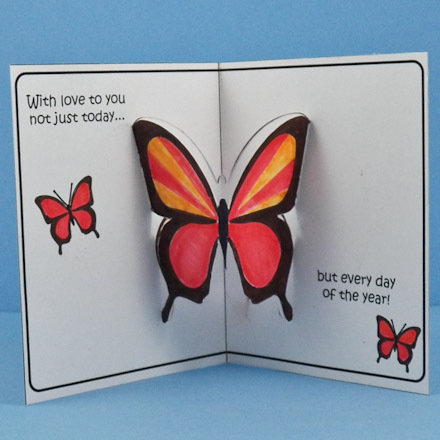 When the card is opened, a heart or butterfly will spring out! 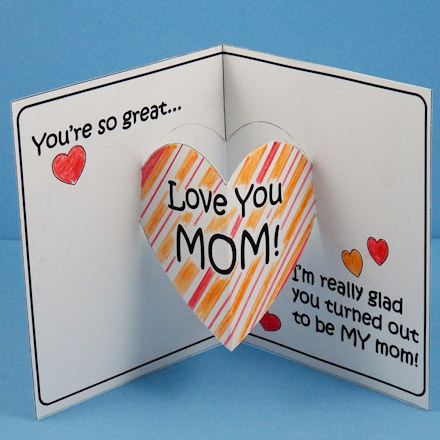 The project includes black & white and colored patterns for two Mother's Day card designs, with matching envelope, and printable patterns for separate heart pop-ups that can be added to any handmade or commercial card. The pop-ups are simple and easy enough for children to make and offer flexibility for the the creativity of teen and adult crafters. 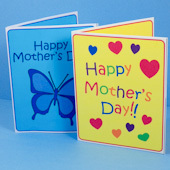 Related crafts: Make a gift for Mom that goes with the pop-up card—see Gifts Kids Can Make for Mom. 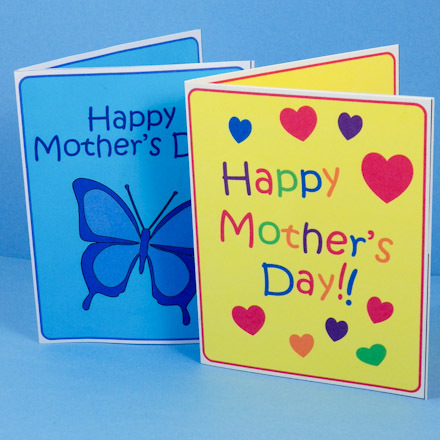 Related crafts: For more pop-up cards and easy to make greeting cards, see the projects listed in Greeting Cards Kids Can Make. 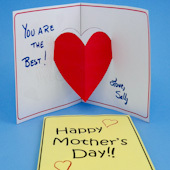 Or for adult card crafting, see the Greeting Card Class tutorials. Choose the card you want to make and download the pattern. Each card pattern has two pieces: the top piece is the outside of the card, and the bottom piece is the inside of the card. Print the pattern on white paper or cardstock. The card will be sturdier if it is made using cardstock. 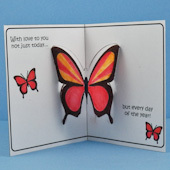 Note: The butterfly pop-up is more difficult to cut than the heart pop-up. If you like, download and print the matching envelope for your pop-up card. Follow the instructions on the pattern for making the envelope. Related craft: See the Envelopes to Make craft project for another style of envelope that fits these cards. Tip: You can also add a heart pop-up to any handmade or commercial card using the Separate Pop-Ups pattern below. 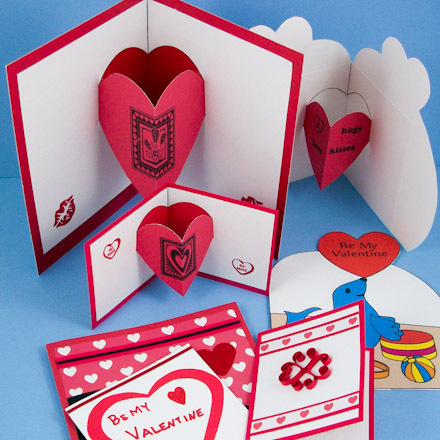 This pattern includes heart pop-ups in four sizes; the largest size fits the cards made in Aunt Annie's greeting card tutorials, and the smaller sizes fit the Heart-Shaped Cards. 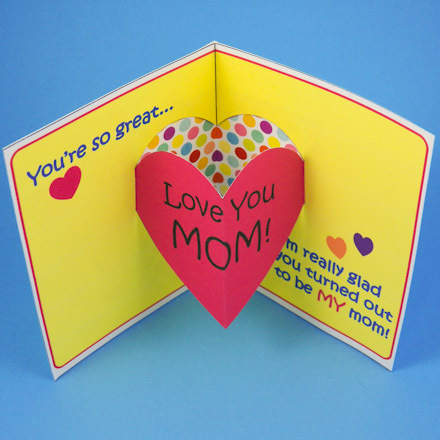 To use these pop-ups, pick one that fits inside your card and follow the directions below for making the pop-up and gluing it inside a card. Tip: Use the Customize patterns as they are OR you can write on the heart pop-up to make it just right for your Mother or any person you want to honor on Mother's Day. If you printed a black & white pattern, color it with markers or colored pencils. Pick any colors you like to color the card. Pick red for the heart, maybe black and yellow for the butterfly, or do something wild! How about zigzag stripes? Use your imagination! Tip: Stripes are an easy way to color a heart pop-up. Tip: It is easier to make straight cuts with a craft knife and ruler. Protect the table with thick cardboard or a cutting mat. Place the ruler along the line being cut, then carefully draw the craft knife along the ruler's edge. Be sure to keep your fingertips away from the knife. Kids, be sure to get adult help when using a craft knife! Fold both pieces in half on the center line. Fold them so that the marks are on the outside. If you are using cardstock, score the fold lines first. To score: Turn the card with the printed side up. Score along the center fold line using the bone folder or empty ballpoint pen to make an indent, not a cut. The pop-up is on the inside card piece and is folded in half. Cut around the heart or butterfly on the solid line, leaving the unmarked edge of the pop-up uncut. Fold the pop-up back and forth along this uncut edge. Tip: The unmarked edge on the butterfly pop-up is on the outside of the upper part of the wing. Put glue on one half of the inside piece, and then slide the two card parts together. That is, put the pop-up piece inside of the card's outside piece. Press. Turn the card over, and put glue on the other half of the inside piece. Press again. Be careful not to get any glue on the pop-up. 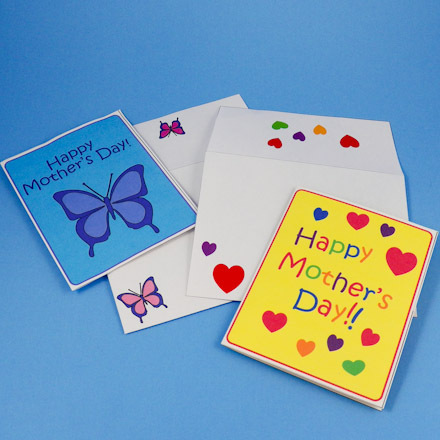 Tip: Cards can be made with paper or cardstock. Tip: Make matching envelopes for your pop-up cards using the printable patterns. Tip: Print the Plain Heart Pop-Ups on white or colored paper. Decorate the card with your own ideas! 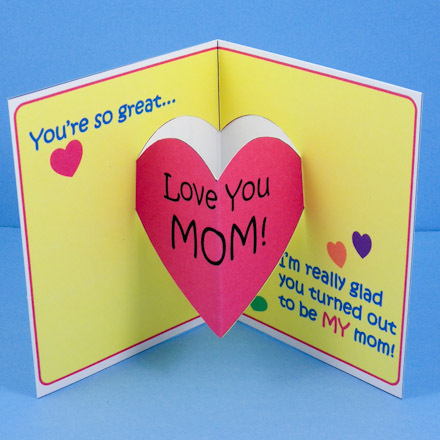 Or use the Customize patterns and write on the heart pop-up, under "Love You," your favorite name for your Mother (Mum, Mummy, Grandma) or the name of anyone you want to honor on Mother's Day (Aunt Sally, or even Dad). Tip: Add the separate heart pop-ups to pocket cards, quilled cards and Heart-Shaped Cards. Tip: Print the black & white patterns and color them any way you like. Tip: To back the heart pop-up cutout with decorative paper, glue a square of fancy paper between the card's outside and inside pieces. One of Aunt Annie's bright dots ePapers was used to back this pop-up.